There are a handful of foods that people either seem to really love or really hate. Tomatoes. Cilantro. Fish (gross!). Onions. The one that blows my mind? Mushrooms. I LOVE mushrooms! Evan and I made Thai soup last week that included some delicious king trumpet mushrooms, and as we packaged up the leftovers, we had a good chuckle after realizing that we had cherry picked all of the mushrooms out! In our house, there are many dishes that are incomplete without mushrooms. I use a ton of mushrooms when I make pasta sauce. They go great with eggs, on pizza, burgers, salads, chicken, and pot roast, just to name a few. I’ve been sautéing mushrooms as a side dish for years. One of my old favorites is sliced white mushrooms sautéed in butter until they are soft and the edges are just beginning to crisp. I also really enjoy sliced portobellos tossed in a pan with olive oil and balsamic vinegar, then reduced until all of that delicious liquid is absorbed. But now one of the cleanse recipes for marinated mushrooms has become my new favorite! You will need 2-3 large portobello mushroom caps, olive oil, balsamic vinegar, pure maple syrup, a shallot, a lemon, salt and pepper. Using a wet paper towel, gently wipe away any dirt from the mushroom tops. 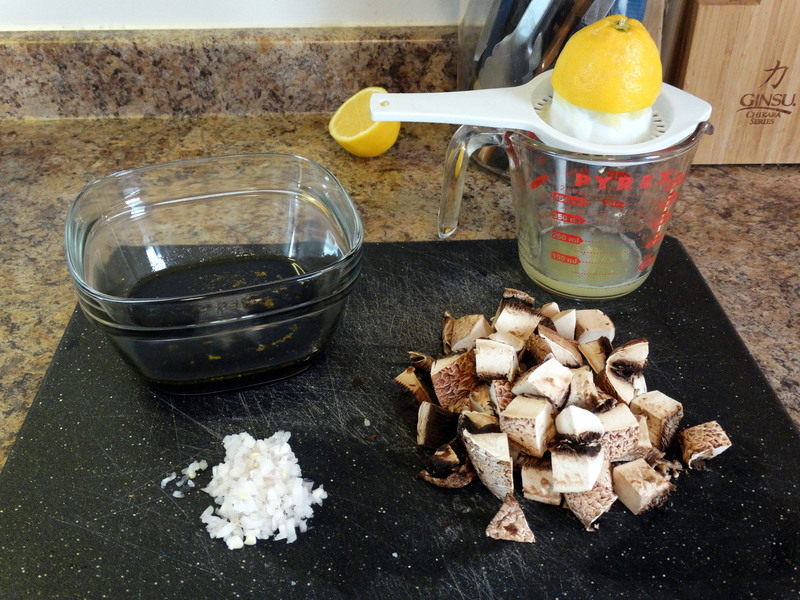 Remove the stems and cut the mushrooms into 1″ cubes. 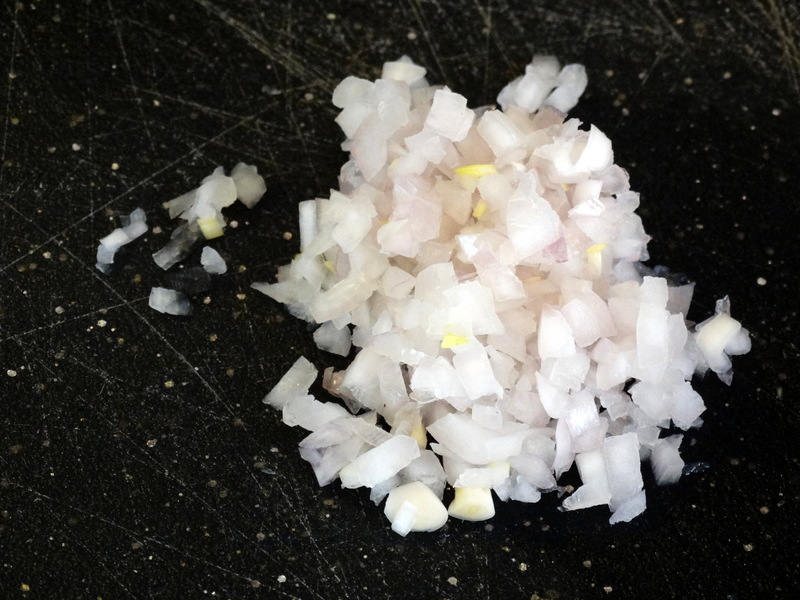 Peel and finely chop half of one shallot and juice half a lemon. Add 1/4 cup balsamic vinegar, 3 tablespoons olive oil, 3 tablespoons pure maple syrup, the chopped shallot, lemon juice, a pinch of sea salt, and a pinch of freshly ground pepper to a container or bowl with a lid. 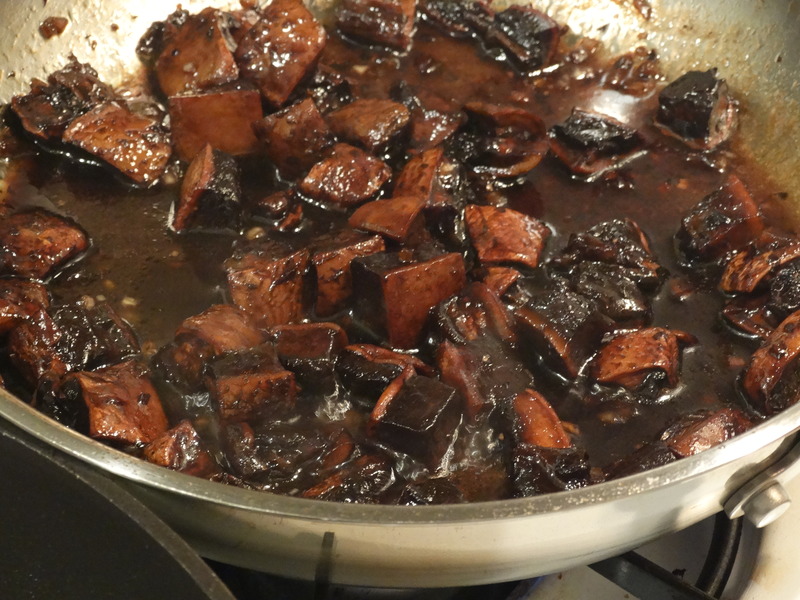 Add the cubed mushrooms, cover, and give them a good shake to combine and evenly coat the mushrooms with the marinade. Put them in the refrigerator to let the flavors seep into the mushrooms for at least two hours. I like to let mine set overnight so that they can absorb even more yumminess. When you are ready, put them into a skillet and cook over medium high heat. Let them boil gently in the marinade for about 10 minutes, stirring occasionally. The mushrooms will release their moisture as they cook and then reabsorb the marinade. Once most of the liquid in your pan is gone, you’re mushrooms are ready! These sweet-and-savory mushrooms are amazing on their own as a side dish, but are also great over zucchini pasta as pictured at the beginning of this post, or as a salad topping. However you decide to use them, enjoy! 1) Using a wet paper towel, gently wipe away any dirt from the mushroom tops. 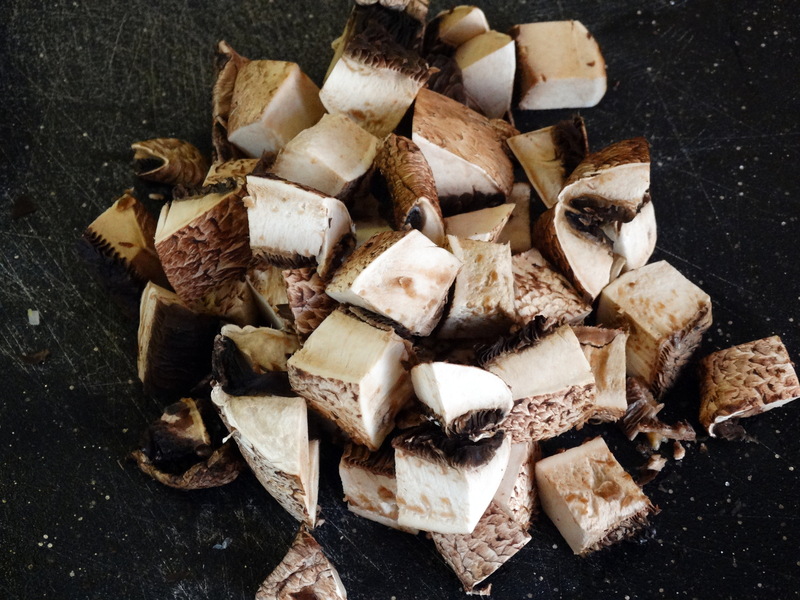 Remove the stems and cut the mushrooms into 1″ cubes. Peel and finely chop half of one shallot and juice half a lemon. 2) Add 1/4 cup balsamic vinegar, 3 tablespoons olive oil, 3 tablespoons pure maple syrup, the chopped shallot, lemon juice, a pinch of sea salt, and a pinch of freshly ground pepper to a container or bowl with a lid. 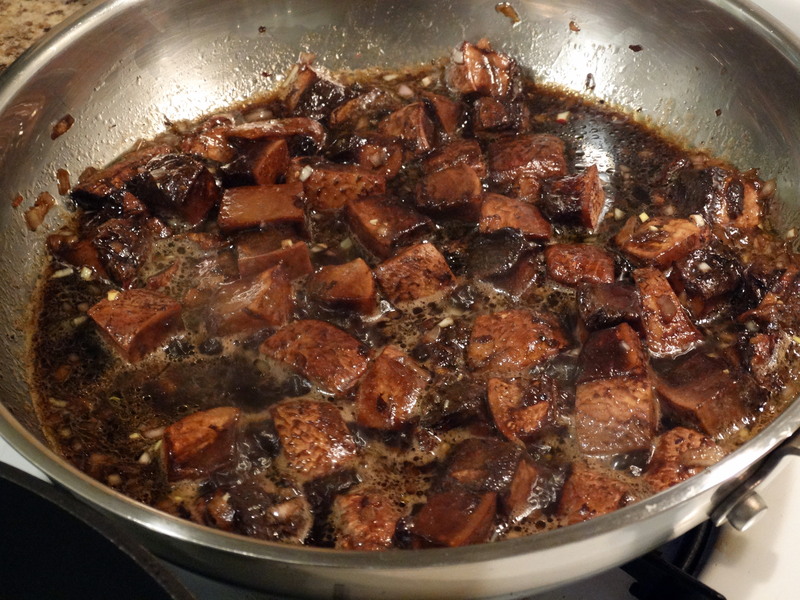 Add the cubed mushrooms, cover, and give them a good shake to combine and evenly coat the mushrooms with the marinade. Put them in the refrigerator to let the flavors seep into the mushrooms for at least two hours. 3) Cook them in a skillet over medium high heat. Let them boil gently in the marinade for about 10 minutes, stirring occasionally. Once most of the liquid in your pan is gone, you’re mushrooms are ready. Enjoy! 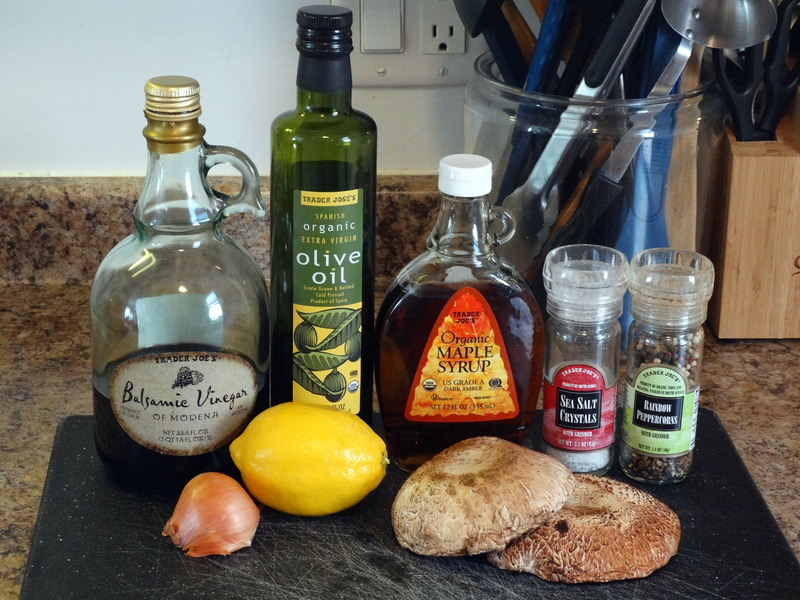 Balsamic vinegar is so great for adding flavor to healthy dishes. Thanks for sharing at the link up today!